Akin Akintayo: Editorial: How do we capture the desire we all have for Nigeria? Editorial: How do we capture the desire we all have for Nigeria? Great is the wish and desire for better topics than what I am about to write about Nigeria. This is a great country with amazingly unrealised potential that appears to be continually rundown by those who we have elected to represent us at all levels. The problem is however not just that of leadership, it includes the people too and sadly an inability to grasp the fundamental truths of a situation, an idea or a conversation if there is something emotive to offer upon which they can gorge their sentiments on. Nigeria cannot be doomed, there is prospect and promise beyond compare and ability that needs to be nurtured to wrestle power from the malefactors in charge and command the heights whilst mentoring those coming up to occupy and take Nigeria to where it rightly belongs – a prosperous thriving country with people willing and able to pursue their goals in happiness with all opportunity and ability at their disposal to succeed. Things need to be uprooted, overturned, jettisoned, condemned and completely excoriated. These things are exemplified and personified in people – men and women who present no glowing future for the entity Nigeria or the identity Nigerian. They clog the corridors of power and need to be bulldozed out of the way, swept into ignominy as light gets shone on their opinions, activities and alliances. Today, it was the turn of the Minister of the Federal Capital Territory to be readied for the scrapheap of odium so vile that it cannot be countenanced by rats cavorting in a metropolitan sewer. “May I suggest to the Executive Secretary of FCDA, who has the Abuja Master Plan and the Coordinator of Abuja Metropolitan Management Council to rename this place as Goodluck Jonathan District.” He started . “This is because we have not named any district after any president in the past. The president I know is President Goodluck Jonathan and the president I know that is bringing good luck to me and to Nigerians is President Goodluck Jonathan.” He then said. “Therefore, by the powers conferred on me, I change the name of this district to Goodluck Jonathan District.” He concluded. Now, there is nothing wrong with naming places after past leaders of Nigeria, we have universities, airports, roads and buildings named after many of our heroes past, many long gone but with places in the history of Nigeria. In most cases, these naming acts though unilaterally done by those in leadership do have popular appeal and support with many Nigerians knowing why. It is quite strange to rename a district in the Federal Capital after a sitting President who has only been in office for two years and yet to prove himself as an effective master of his brief, talk less of being an all-embracing and inspiring leader of all Nigerians. Maybe I am being harsh with my assessment so let us hear the citation the Minister gives to make the President worthy of such an honour. "A district has never been named after a President ..." – that is a valid point but we have had many, 14 in all , starting with Nnamdi Azikiwe, the 1st Governor General and the President of Nigeria; Johnson Aguiyi-Ironsi, the 1st Military Head of State or Murtala Mohammed, the 4th leader of Nigeria assassinated in 1976. Sani Abacha for his despotic reign is not offered a podium of honour but he is one of the 4 who once ruled Nigeria and have since died. Other leaders of distinction, I use distinction with a bit of levity are Yakubu Gowon who lead the country through a civil war, ruling for 9 years or Olusegun Obasanjo who ruled the country twice, first as a military ruler and then as a civilian president altogether for 11½ years. Only last week with full military honours and all the state accoutrements, Emeka Odumegwu Ojukwu was buried, he led the civil war for the secession of Biafra and had long been revered as the leader of the Igbo tribe, it would appear he was the next for the synonymous and eponymous but you cannot curry the favour of the dead. – Surely, there is much to be said for these people. The Minister goes on to say, “The president I know is President Goodluck Jonathan …” This could mean the Minister is completely oblivious of Nigerian history or cynically one might be persuaded to suggest this was blatantly currying favour since he is minister at the pleasure of the President. He concludes the citation by saying, “… and the president I know that is bringing good luck to me and to Nigerians is President Goodluck Jonathan.” Is that all? You ask. The President is honoured in a shameless display of sickening sycophancy as a fawning minister is innocuously 'bribing' the President to maintain his post by flattering the President and appealing to his ego, building graven images of district renaming like we have returned to the Babylonian times of King Nebuchadnezzar. 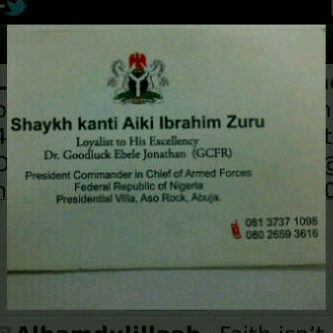 We sometimes forget we are in a democracy and we operate like an absolute monarchy because it can only be the reason why a Shaykh kanti Aiki Ibrahim Zuru has a calling card with the title Loyalist to His Excellency, Dr. Goodluck Ebele Jonathan (GCFR). Obtained from a tweet by @Seedorf with thanks. This whole charade of leadership in Nigeria is playing out like the Court of Goodluck I where patronage is rife and obsequiousness that can provoke extreme emesis is the norm, as for corruption, that is the currency of the gaining audience with the potentate whose name might soon be emblazoned on anything that can be named or renamed just before our prayer beads are replaced with the mini-busts of Goodluck Jonathan. To crown it all, the Nigerian Senators who receive 350% of their annual basic salaries as car loans payable over 6 years at the annual interest rate of 4% were given cars  all same at additional cost of N1.3 billion to the public purse on the premise that they will be used for committee activities. It is illegal and criminal but impunity is the name of the game and accountability is as unAfrican as let’s say homosexuality. We cannot be sentenced to this travesty of a democracy which is in fact fawning kleptocrats at the head of an unconscionable kakistocracy – Nigeria deserves a lot better than all this.